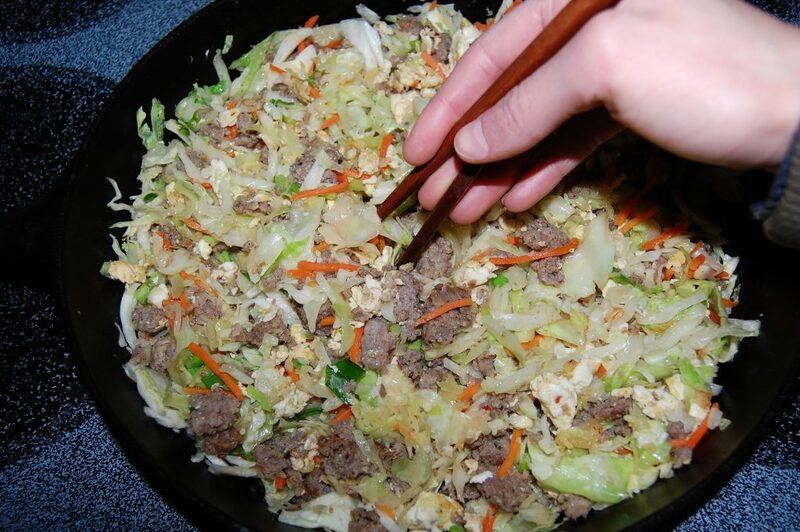 Healthy, low-carb, egg roll filling without the fried wonton wrapper! In a large skillet, over medium-high heat; add the sausage, cook stirring often to crumble, until cooked through. Do not drain. Meanwhile, crack eggs into a small bowl. Add a pinch of salt and black pepper. Beat the eggs with a fork. In a small non-stick skillet, melt butter over medium heat. Pour the eggs into the center of the pan. As eggs begin to set, gently pull them to the center of the pan with a rubber spatula, forming large soft curds, and allowing the liquid to run to the edges of the pan. Continue cooking, pulling, lifting and folding eggs until thickened. Do not stir constantly. Your eggs are ready when they look fluffy and shiny. Note: They will continue to cook after you remove them from the heat. Do not over-cook! 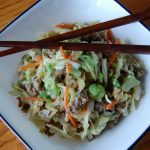 Add the coleslaw mix, garlic, ginger, and soy sauce to the skillet with the sausage; cook for 3-4 minutes or until cabbage has softened. Remove from the heat, gently stir in eggs. Top with the green onions and drizzle with sesame oil. Serve immediately.